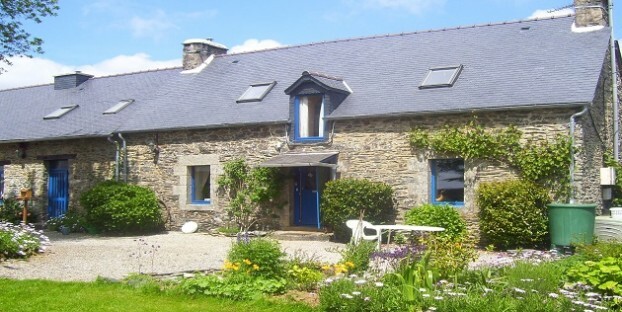 Rose Cottage is located at Le Boterff, a complex comprised of 3 gites, a B&B and a campsite situated in central Brittany in an area of outstanding natural beauty. Rose Cottage can sleep up to 6 guests in 3 bedrooms and has a lovely sunny courtyard to the front of the gite with a table and chairs for dining al fresco. Rose Cottage has a very spacious open plan living/kitchen/dining area and the kitchen is well equipped with everything you are likely to need during your stay. There is a full sized dining table so everyone can sit and eat together and a feature woodburner making the gite ideal for out of season breaks. Upstairs are 3 good sized bedrooms and an extra guest can be accommodated in a single bed on the mezzanine if required. If you are planning a holiday as an extended family or with a group of friends, Rose Cottage can be booked with the other gites on site, Chevrefeuille and The Roost to provide accommodation for up to 13 guests. There’s plenty to do on site, with over ¾ acre of lovely shared gardens to explore. If you like to relax on your holiday, Rose Cottage is perfect for enjoying the Brittany sunshine and dining al fresco with a BBQ and a glass of wine on the terrace. Although Rose Cottage is situated in rural Brittany, it is centrally located for exploring this beautiful and popular region of France and all areas of Brittany are easily accessible from Le Boterff. It’s also just an hour and a half from Roscoff or St Malo ferry ports so it’s ideal for guests travelling with young children. The village of St Mayeux is just 1.5km away where there is shop, Post Office and bar and the stunning Lac de Guerledan is 10 minutes away from Rose Cottage. Lac de Guerledan is well worth a visit during your stay and here you can relax on the safe sandy beaches, swim, sail and enjoy many water based activities – you can even hire a pedalo! There are also many medieval towns just waiting to be explored such as Dinan, Vannes, Concarneau, Moncontour, Quintin, Josselin, Pontivy, Locronan and Quimper to name but a few. Don’t forget a visit to one of the many weekly French markets to sample some fabulous local produce! Le Boterff is owned by Helen and Carl Smith. They had been visiting Brittany for many years and it has been their dream to live there for many years until they took the plunge and bought the complex in 2012. Helen and Carl love the wonderful coastlines, superb beaches, historic towns and rolling countryside that are just waiting to be explored here. They describe Brittany as similar in many ways to Cornwall in the UK, just without the crowds!